Welcome to our One Minute Mondays: we showcase a statistic or trend from the world of employment and skills in a bitesize form. Women outperform men at all levels of education. A greater proportion of girls than boys receive at least 5 GCSEs at grade A*- C and 21% more women take A-Levels than men. In technical and professional education, since the 2010/11 academic year there have also been more women than men starting apprenticeships. The women studying at university outnumber their male counterparts significantly. Even in what are generally perceived to be the more male dominated STEM (Science, Technology, Engineering and Mathematics) subjects women outnumber men. 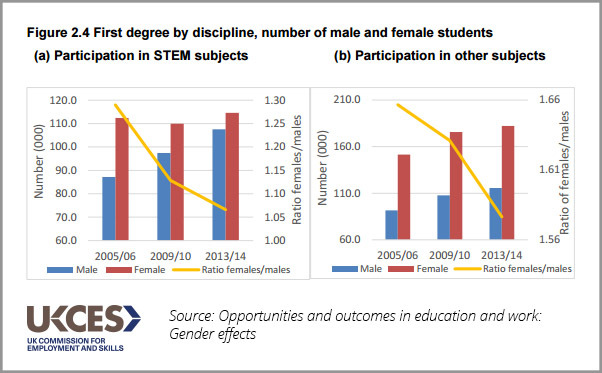 While this female-to-male gender gap in both STEM and non-STEM subjects has closed in recent years, this is not due to a fall in the number of female participants but rather to a greater increase in the number of male students. The educational gender gap does not, however, translate to parity in the world of work, where women still earn less than men in 90% of industries. To find out more about the gender gaps in education and work read our full ‘Opportunities and Outcomes’ report on gender. And look out for the next reports in the series, which will examine inequalities related to disability, age, and ethnicity. Do you have a comment or thought about the educational gender gap? Leave a comment below or tweet us @ukces. Demographic challenges for the health and social care sector?